Issued Thursday July 19th 2018. 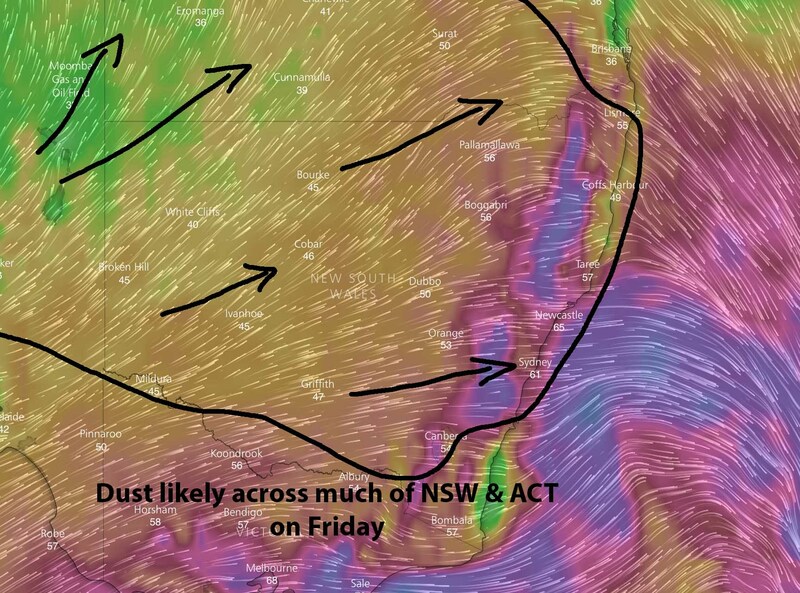 There is growing talk about dust storms impacting large parts of QLD and NSW over the next 24-36hrs. Above image showing the QLD threat area and wind gusts via Windy. Models are indicating that a trough is expected to move through Inland NSW, Southern and Western QLD overnight Thursday into Friday, pushing towards the Coast during Friday. Strong to gusty West to South West winds behind the trough line are expected to pick up and carry loose dust leading to likely dust storms over South West QLD, North East SA and Western NSW. 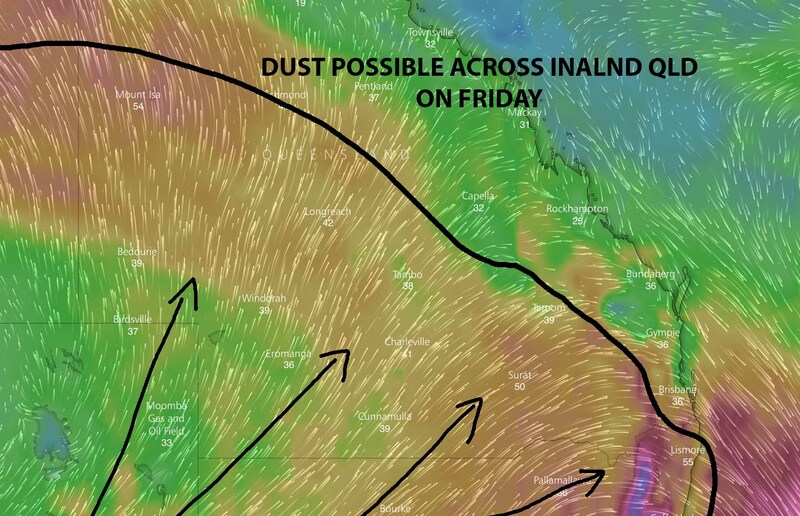 As the system pushes towards the Coast, its likely to lose intensity over QLD which should lead to raised dust across large parts of Inland QLD – but not necessarily dust storms. While the trough is expected to push through to the Coast, the dust isn’t expected to reach the Coast… or if it was to reach the Coast, it will barely be noticeable for most people. Across NSW however, winds are expected to strengthen over the ACT, Central and Northern Tablelands + surrounding areas – possibly reaching damaging thresholds of over 90km/h in isolated pockets.. this may help push the dust through to the Coast for areas between Wollongong and the SEQLD border. Again, it may not push through as a dust storm, but more so raised dust. Given the ground conditions across large parts of Inland NSW and QLD and the time of year where fronts typically push through – these kinds of conditions aren’t uncommon. In fact, we’ve already seen a few dust storms across NW VIC and Inland NSW this year. There has been some talk around South East QLD too about the haze in the sky today (Thursday). This has been caused by smoke as lots of small back burns occur. The smoke has been trapped under an inversion and as the sun shines through, it creates a deep orange or red hue. Dust threat area with wind gusts for Friday afternoon via Windy.